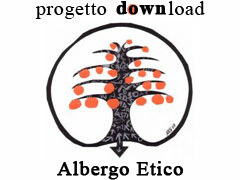 “Albergo Etico” was founded in 2009, thanks to a happy intuition of a group of friends and professionals eager to make their contribution to improve the society they live in. Driven by a specific need, that was their desire to help a boy with Down syndrome to complete his educational path with a traineeship, they identify first a restaurant, and then a hotel, as the ideal place to share expertise and moments of professional and personal growth. In that same period, the Scuola di Formazione Colline Astigiane was looking for a traineeship for one of its students, Nicolò, to help him get his school diploma. Chef Antonio De Benedetto, a former student of the same institute, immediately accepted the proposal made by the Director of the school, Mrs. Barbarino. It was an unpretentious traineeship of a few weeks, a sort of bureaucratic procedure, with modest results. But for Nicolo it was much more. Today, that same trainee is the symbol of a restaurant, a movement, a process that is transforming the city of Asti, and not just it. Today, he has the keys of the restaurant, he has friends and he lives by himself. And, what’s more important: he has a regular employment contract and he carries out tutoring activities for other guys. Nicolo took Albergo Etico to European Parliament in Brussels, to the Quirinal to meet President Napolitano, to the Vatican, where he shook hands with Pope Francis, to the Piedmont Region, where he was awarded by President Cota and Chiamparino. Thanks to the press, the TV and the radio, as well as to some major sports and food events, Nicolo and his colleagues have become the symbol the desire to change and live an active life. The tourism sector, as demonstrated by the project implemented by Associazione Albergo Etico, is a privileged channel for the employment of people with intellectual disabilities. Hotel, with their reception, offices, restaurants, bars, breakfast rooms, kitchens and staff rooms a microcosm, the ideal place to learn new things and how to live with other people. The work includes both front office and back office activities, some in direct contact with customers, while others requires individual tasks, and this is important, because it help develop different skills. We called it “Accademia dell’Indipendenza”: a three-year training/work program at Albergo Etico. It is a gradual process, through which people learn to carry out all the activities of a hotel and a restaurant (artificial nest) to replicate them in a family context (their own nest). 3 years are enough to learn how to live an independent life. These guys sleep in the staff rooms, to cut the umbilical cord with their family and learn how to live with their peers. This makes them more responsible. Here there are no assistants and/or educators, but only co-workers, helping each other.